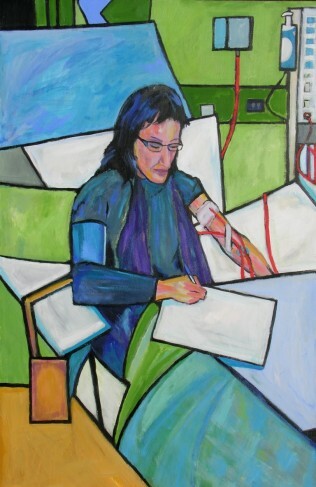 Johanna Tanner is a Dialysis patient in Waterford Regional Hospital who has been participating in the Waterford Healing Arts Trust’s Arts programme since 2008. Here she talks about her experience. I first came to the Renal Dialysis Unit in Waterford Regional Hospital (WRH) on 8 June 2008. I had lost both kidneys to clear cell carcinoma, mostly associated with kidney cancer, and I was totally dependant on dialysis for fluid balance and cleansing of my blood system. It’s pretty stark losing one’s kidneys and I was wondering how this loss would be addressed long term, and how I would cope with it. There was a feeling of welcome towards me in the Unit and the reassurance that I would be cared for was a relief. The professionalism and warmth of the staff made the abnormal seem normal. Dialysis takes for four hours, three times a week, and although I loved crosswords, something I inherited from my Father, I felt I would be doing them for ever now – there wasn’t anything else I felt I could do while on the machine.. In 2008, the Nursing Manager, Brenda, introduced me to Philip Cullen an artist from the Waterford Healing Arts Trust (WHAT). She announced that he was offering his artistic services as part of an arts programme for Renal Dialysis patients. I agreed after a persuasive chat from Philip to try and write a poem for the following week’s arts session. I had loved writing all my life and played music professionally. I used to get a great kick out of describing something that had happened to me on stage, and general incidents in life that would call for visual description. I would graphically describe and dramatically build up bit by bit the experience. I did this mostly in letter form. I had also kept a journal sporadically to help me through my various operations and life’s traumas. I told Philip, as a delaying tactic which backfired, that I loved my long finger. His response ‘why don’t you write a poem about your long finger?’ Hence the title of the first poem sprung into being. I wrote the first verse on dialysis and the following verses at home. Thinking that it had little merit, a ridiculous poem with a ridiculous title, I felt he would see there was no point in continuing with poetry. A positive reaction was not what I expected the following week. There was no putting this man off. Two years later a poem entitled The Healing Artist captured what this writing time on dialysis meant to me. I became very aware that Thursdays was our arts day, and this made it different to every other day in the week. Another patient, Frank, opted for drawing with Philip. We were eventually put on dialysis at the same time to facilitate Philip’s work with both of us. In time Frank and I checked up on one another – ‘have you your home-work done?’ Sometimes we would be completing it in a hurry before Philip arrived. This scenario was exacerbated by Nora a member of the catering staff who exposed the situation to other patients. So began the fun and banter, which in time, with good Irish wit and the gentle humour of the international staff, drew in other members of staff. Nora took a particular set on Philip to our delight. He explains it well. The atmosphere was creative. The patients loved the fun wrought by these activities and Nora’s joyful voice and commentary. Thursdays became the day of creative activism which was good for the mind and soul. I began to feel physically better – writing took me away from the resignation of our existence. It was no longer dialysis that seemed primary, though it is; the art rose in a positive purpose and absorbed those four hourly sessions with creative access and practice. It developed an interchange of interest between the staff and us in a new way. We were given back our sense of person. We were no longer just patients lying in beds. When not on dialysis my mind was in a continual search for words best suited to a given project. I observed nature and scenery, listened more attentively to what people were saying, wrote down notes or rushed for a pen to capture a thought. The family were very encouraging and delighted at the change taking place in me. They were aware of the horror and suspense I experienced between each new diagnosis and how writing creatively lifted me out of despair and worry. They were full of suggestions for each project, and were a powerful backing of love for all our endeavours. Writing became cathartic as I explored my illness and resulting operations and procedures through it. My experience moved out from me into a book entitled Beyond Captured Time. Although in the beginning crosswords helped me exercise word power as a prelude to creative writing, I have traveled a long way since then. A crossword now might seem a waste of time. What I am now doing eats up dialysis time – I am always thinking, composing and battling to get new words out. Throughout, my self-doubt struggled with my determination to go on. Over time, thanks to the steely encouragement of a gentle artist, I let go of the doubt and journeyed to places I could never have imagined possible. Johanna Tanner is a patient in the Renal Dialysis Unit at Waterford Regional Hospital and a participant on the WHAT arts programme.